MOONDOG’S FIRST OUTING – LAKE BURLEY GRIFFIN TRADITIONAL BOAT FESTIVAL. THE MOTIVE POWER IS VERY TRADITIONAL – IT BUILT THE PLANET! 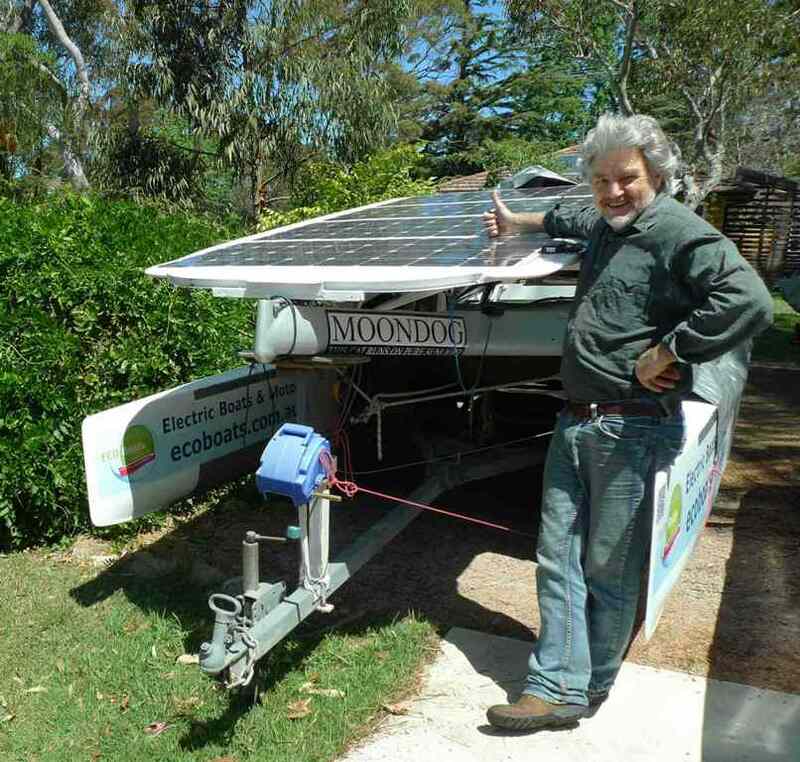 A SOLAR POWERED BOAT POWERED OFFICE – IS THIS A WORLD FIRST? I have been a solar power enthusiast since 1990, when I bought my first 160 watts of Solarex panels to power the house batteries in my motorhome. Since then I powered my own home in 1998, and designed many dozens of other solar powered buildings. And being a sailor, I am also have a fascination with solar powered boats. But how could I justify spending thousands on a fancy solar boat which would sit in the driveway at least five days a week? What about using it to power the office? Or at least, the computers in the office. 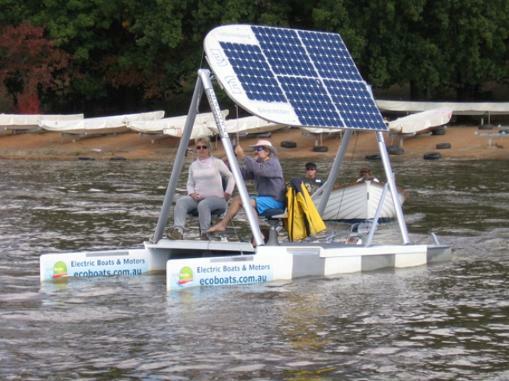 My first foray into serious solar boats was a race boat specifically designed and built to compete in the now defunct solar boat races on Lake Burley Griffin. With my kids’ school, Covenant Christian School at Belrose NSW, and sponsored by Discovery Channel, we built a world beating boat to the International Solar Rule. It was a one purpose boat, a bit like a Formula One race car – useless for anything else. After we fitted a high performance lightweight array built by Solar Sailor, the boat was unbeaten during eight years of competition. Rather than spur on competition, we seemed to scare it away! Click to see the 1 Minute Movie MOONDOG ON LAKE BURLEY GRIFFIN. Also see a longer movie of Moondog being useful – exploring shipwrecks, below. 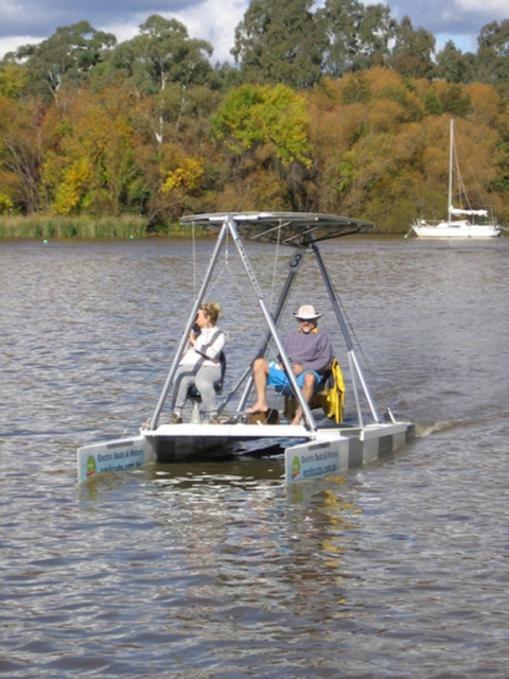 A couple of years ago I decided to build a multi-purpose solar boat – one that could take a few passengers, with an open deck that could be accessed by a wheelchair, or used for photography, fishing, camping, almost anything. A kind of lightweight water-ute. So Moondog, the solar powered cat, was conceived and designed with what we had available – our standard architectural CAD program. My sailing boat of choice is the A Class Catamaran – the Formula One of sailboats. A lightweight single hander, it is fast, precise, and more than enough of an adrenalin fix for anyone. The boat I was sailing at the time was nearly twenty years old, and apart from being much slower than newer boats downwind, it was beginning to creak when pushed hard. Time to give it an easier life. It is an early example of kevlar epoxy and foam sandwich construction – pretty advanced for 1990. It also had very deep hulls for an A Class, which provided useful buoyancy for the extra weight it would carry. I was determined to make the construction as sustainable as possible, in the end being about 75% reused or recycled. Retaining the hulls and cross-beams, I replaced the trampoline with a box-girder ply and carbon fibre deck. The ply is FSC Gaboon marine ply, sourced from Denman Marine in Tasmania. It is grown in the Philippines, and made in France. Gaboon is the boatbuilder’s ply of choice for its strength to weight ratio, but is a rainforest tree, so being certain of its provenance was essential, and FSC is the only certification system I fully trust. Clearly it has covered a lot of sea miles to get to Sydney, but I wanted to be part of the early push for FSC marine ply, in an industry which still sources a lot of ply from unsustainable sources. The carbon fibre applied to the underside of the bottom skin is the tension skin that enables the rest of the deck to be thin and light. The new deck extends forward of the original main beam, to allow the longitudinal centre of gravity to be located over the deeper forward sections of the hulls. Second hand hatches allow access to the hulls, which had foam fill installed to half depth for positive buoyancy. The solar array was reused from the old school race boat, but I discovered the soldered connections between the original cells were failing by degrees, in spite of micro-surgical resoldering. So 500 watts of new Solbianflex lightweight panels was installed onto the original aluminium space-frame. This array is supported by an A-frame fore and aft, which can be lowered for trailing. The PV output is maintained in either position. The A-frames were constructed from the mast of another old A-cat, with other bits of scrap aluminium used for the head fittings and braces. The raising and lowering mechanism is brute strength, but as the array only weighs 10kg, it is not that hard. Assorted old boat fittings provided the stays and safety clips to keep the A-frames pointing upward. 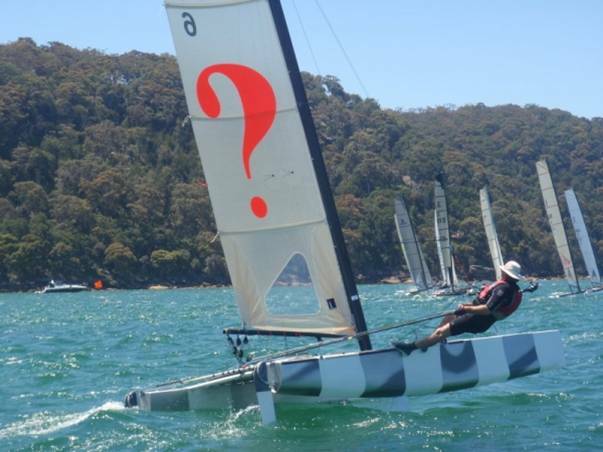 The advantage of A-frames is that they allow the array to tilt from side to side to pick up low sun – a feature carried over from the old raceboat. It gives over 2m standing headroom, giving shade and some protection from rain. In stronger winds we have a policy of not tilting the array, just to be sure we have no windage problems. The four Solbianflex CP125 panels give a maximum rated output of 500 watts. As Collyn Rivers and other PV gurus are at pains to point out, actual output is usually 20% less than rated output, although the Solbianflex panels appear to be less prone to heat-fade than many cheaper panels. They are 16.5% efficient, and although there is a higher performance series available, the layout on the frame meant they offered no advantage in this case. These mass-produced panels cost exactly 25% of the cost of the super-duper experimental hand-made Solar Sailor1 panels in 2001, for exactly the same output. Nice how PV affordability has changed! 500w drives the boat at about 4 knots (7.5kmh). Faster speeds theoretically then draw down on the batteries. The charge control is currently in a state of flux. Originally we installed a GSL BMPPT800 maximum power-point tracker (MPPT), with the panels in parallel for 12v input to the controller, which then outputs 24v to the batteries. This is because the motor is 24v (more on that below). We are also testing a couple of Redarc BCDC1240 charge controllers, which also have MPPT functionality. One of the issues we are yet to fully resolve is that while the controller is charging the batteries nicely, it is not allowing the PV array to power the motor fully – that is, the array is being held back from delivering full power. This is causing some scratching of heads, but I’m confident there is a simple elegant solution waiting somewhere. Batteries are there to provide reserve power, although as mentioned above, at present they are contributing too much. We have a pair of 55AH Optima Blue Top spiral wound AGM deep cycle batteries, one in each hull, as far forward as we could get them to balance the longitudinal centres of gravity (LCG) with buoyancy (LCB) for a nice level trim. All cables are 6mm2 or bigger, and circuit breakers protect every positive. Budget permitting, these will one day be replaced with lithium ion, to reduce mass. Without any solar input, 55AH provides a couple of hours motoring at 4 to 5 knots, or about half full speed. This is also the speed limit in most closed waterways. The motor is a Torqueedo Cruise 2.0R two kilowatt electric outboard. This is a nice example of German engineering with a price tag to match compared to cheaper Chinese motors. But there is a reason Torqueedo is the standard by which all others are judged: they still work long after others have died, so the investment in longevity and importantly, reliability, is well worth it. The Cruise 2.0R is the remote control forward steering version. This allowed me to install two brand new (couldn’t find second hand) swivel seats in a forward position, with a deck mounted horizontal steering wheel mounted between them. So you can sit in either chair, steer with one foot, leaving both hands free for camera, rod, beer – whatever. The motor contains a GPS, and the remote control shows speed over ground, instantaneous power consumption, battery voltage and distance remaining at current power draw. A conventional forward and reverse lever controls speed. The motor is rated to draw 2kw, but at full throttle from a standing start will draw 2.4kw. Happily, all the components allow this without complaining. But as everyone knows, if you use full power your energy reserves don’t last long. I added a cavitation plate to the outboard leg, to allow full power reverse to stop the boat from full speed ahead within 1.5 boat lengths. The old A-cat trailer was no longer suitable, so Ebay provided a useful donour which was adapted with scrap steel and second hand rollers into a purpose-built trailer which makes launching and retrieval a breeze, without submersion, which extends its life dramatically. The whole rig weighs less than 400kg, so is quite easily and economically trailed on the road. So far we have only used Moondog for short trips exploring the shipwrecks of Sydney Harbour, the quite backwaters of Pittwater, and a trip to the Kalang and Belinger Rivers to promote the Bellingen Energy Festival. We will be exploring the Myall Lakes in early 2013, but we are looking for something really meaningful for Moondog to sink her teeth into – suggestions welcome. In the meantime, her Monday to Friday job is running the computers in the Envirotecture office. The boat is parked in full sunshine, so it is able to make a useful amount of power – we just had to find a way to get it into the equipment. We have a Redarc 700w inverter, connected by a heavy duty 12v cable with 35amp Anderson plugs. The inverter is similar to those in any grid-interactive PV system, just a bit smaller. It is mounted in a secure weatherproof box beside the boat, with the 240v outlet cable running into the UPS which already supplies smooth uninterrupted power to all the computers and printers in the office. We need a UPS because the electricity supply to Sydney’s northern beaches is very susceptible to thunderstorm and windstorm disruption. This effectively gives two reserves of power – the boat’s own batteries in the first instance, and the UPS’ back-up batteries as well. In the office we have three 700w iMacs, A2 and A4 printers, and occasional laptops and other devices. If all of these were to run simultaneously at full power, we would draw more than 3kw. In practice, the iMacs mostly run at less than half pace, and with phone calls and interruptions, are often in monitor sleep mode at various times throughout the day. This gives the boat time to recharge any periods of over-draw. In practice, the array’s (rated) 500 watts of power, in full sun or near to, covers the office demand nicely. Once the sun goes off the boat, we revert to 100% Accredited Greenpower to drive the UPS. In summer, nearly all working hours will be directly powered by the boat, but in winter we will draw at least half from the grid. Over the course of a year, it is expected to be slightly cash-flow positive, after accounting for the cost of the new PV panels, the inverter, and all ancillary equipment, including interest at bank rates. I’m not absolutely sure, but I think this may be the world’s first solar-powered-boat-powered office. Contact us if you know of another – we could form an association! A group of boating enthusiasts and small businesses who have a swag of innovations to make boating more sustainable will be putting their technologies and products on display at Australia’s first ever Eco Boat Show, at Pittwater’s Bayview Anchorage, on Sunday 18 November. 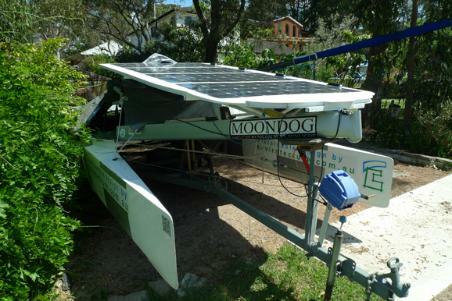 - 'Moondog' solar powered catamaran demonstrating solar-electric power in-water. 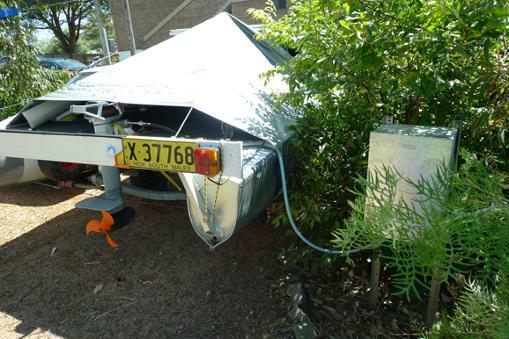 The Bayview Eco Boat Show is open to all, free of charge, at 1741 Pittwater Road, Bayview NSW. Sunday 18 November 2012, 10am till 5pm. CLICK HERE FOR MORE INFORMATION on all the exhibitors and the amazing innovations and brilliant new designs on show.